In fact, Chef Chris Amendola has opened Foraged, described as a "hyper-seasonal eatery" in Hampden. He prowls through to fields and forests of Maryland and southern Pennsylvania, casting a knowledgeable eye over the terrain. The resulting dishes are often small plates, which encourages more browsing, more taste sensations. Early spring is a good time to find ramps in the woods. These savory members of the onion family have become very chic in recent years. Here's a recipe. If you are blanching your ramps (which is only necessary if you’re not planning on using the pesto right away to preserve that bright green color) bring a large pot of water to a boil. Add enough salt to make it taste like the sea. Set a large bowl of ice water nearby. Plunge the ramp leaves into the boiling water for 1 minute. Remove and quickly cool them down in the ice water. Squeeze dry with a tea cloth or paper towels. Chop the ramp leaves and set aside. Pesto is best made with a mortar and pestle, thus the name, which means "pound." You can of course make this in a food processor, but it will not be the same. To start, add the toasted pine nuts and garlic and crush them. Add the cheese and ramps and commence pounding. Mash everything together, stirring with the pestle and mashing well so it is all fairly uniform. Start adding olive oil. How much? Depends on how you are using your pesto. If you are making a spread, maybe ¼ cup. If a pasta sauce, double that. Either way, you add 1 tablespoon at a time, pounding and stirring to incorporate it. When it's a nice rough paste, taste it and add salt if you need to; sometimes the cheese makes the pesto salty enough by itself. Serve as a spread on bread, as an additive to soups, as a pasta sauce or as a dollop on fish or poultry. 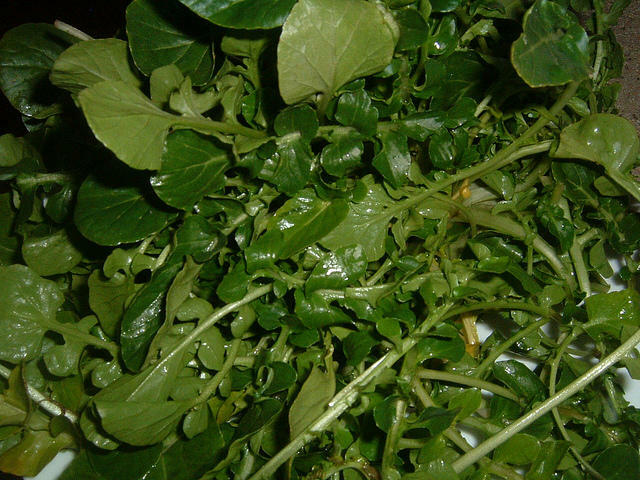 One of the most spicy peppery flavors around is watercress. This aquatic or semi-aquatic plant is a vigorous grower, and is not hard to find near small streams. In foraging, make sure that the water has not be contaminated with manure, which will pass on toxic bacteria to the plant. Useful in salads and dainty sandwiches, watercress in particularly popular in Great Britain. Here's an idea from Jerry. When it is thick, combine it with the rest of the dressing ingredients in a small jar and give it a vigorous shaking until it has emulsified. Allow to cool.